Hello there my dear readers!!! Can you believe it is almost Valentines day??? Testing and reviewing this adorable product has totally gotten me in the V-day spirit! So, do you want a little "mood boosting" Valentine pick-me-up? 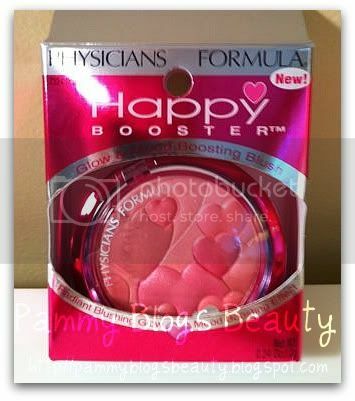 Well, then treat yourself to an item from this cute Physician's Formula Happy Booster Collection! The Happy Booster collection contains a Blush, Bronzer, and a Face Powder. The display at my Ulta (only a few days after the release) was already almost completely out of product! After looking through the options, I decided upon a blush. The Science of Smiling? Can the act of smiling make you happy? Did you know that it is speculated scientifically that when you smile, you actually become, at least physiologically, more happy? I remember reading this in magazines a few times; so, I did a quick google search to read more about this scientific theory (for an example articles, click here and here). This blush is sooooo up-my-alley!!! 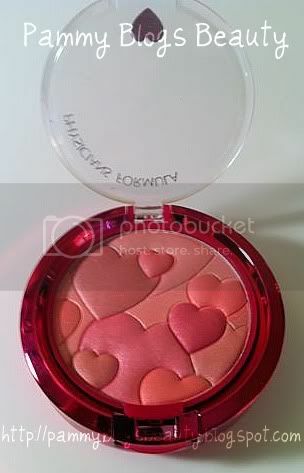 Not only is blush one of my favorite makeup items, but the *HEARTS*, to-die-for cute!!! I am just bananas about Hearts! I love heart shapes for decor, jewelry design, etc. So, of course I love them embossed into a blush pan!!! Not to mention this product's timely release right before the quintessential "heart" day: Valentines Day!!! Super great marketing on Physician's Formula's part. This is a shimmery blush with multi-colored hearts in an array of hues: roses, pinks, peaches, and more brown-based pinks. Swirl them all together (how I apply) and you get a lovely peachy pink color. 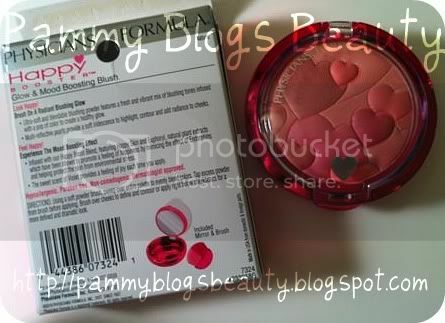 The blush is highly pigmented. On my fair skin, I apply with a pretty light hand. What a flattering blush! This is one of those every-day wearable shades for me! While this product contains shimmer, it does not look glittery on the skin. It just gives you a lovely peachy-pink glow. Beautiful!!! I just wanted to make a note here on the scent and ingredients. This product is "infused with the Happy Boost Blend" (apparently plant extracts which promote a "feeling of happiness"). The scent: The blush is lightly scented with violet, which "provides a feeling of joy when you apply" (lol, according to the package). While some perfume-y scents bother me, this one does not. I think it smells pretty. But, if you don't like floral notes, you might not enjoy the scent. The addition of scent did not seem to bother my sensitive skin. The compact is adorable!!! 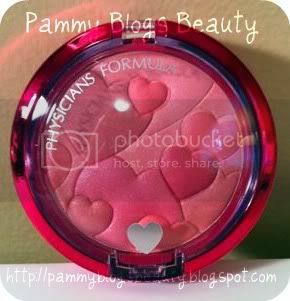 It is a hot purplish-pink metallic compact with a clear lid. Packaging is sturdy and not too bulky. The pan lifts up to reveal a small blush brush underneath. I never use these little brushes that are included (they are too small), but I did want to let you know there was one under the pan. The embossed hearts in the product itself really make the product standout!!! The great news here? I hear that the Happy Boosting Collection is going to be part of Physician's Formula Permanent Line! Yay!!! So, if you are having a hard time finding this in stock, be patient! :) You will find it soon! Hi Pammy! I was looking at this today and was SO tempted to buy it! Its pretty expensive up here though at $19.99 so I decided not to get it right now - hopefully in the future! :) It looks like a great colour and its so true that smiling instantly makes you more happy - we learn that in psych! @sugarbumpkin-Hey girl!!! Yes, I am totally interested in the Stila one too (esp since Stila is one of my fav lines of m/u!). If you don't mind, could you either post the code in a comment, or send me the code on email? I would love to order with that discount! And...yes, the PF one is rather expensive for a Drugstore brand/item. But, still love it!!! @Shaylee-LOL, yes, I whipped out some Psych 101 on you readers! ;) I love that stuff (I minored in Psych in college). Wow, your prices are much steeper on certain things in CAN! (well, hint hint, you might have something from this line headed your way soon....but, I wont say what...so, it will still be a suprise, sorta!). Cant wait to read your lash serum review!!!! @communicatingbeauty-Hey Lauren! No Physican's Formula in the UK? I didn't know that! I hope all is well with you!!! xoxo!!! Great review! I saw this and almost bought it just for the cute factor. I think I for sure need now thought! Better yet they had $6 rebates on the ones I saw. Cute and money back! @Bailey-Great! Glad you got it too...nice deal with the money back!